…and 22% would give up their partner! 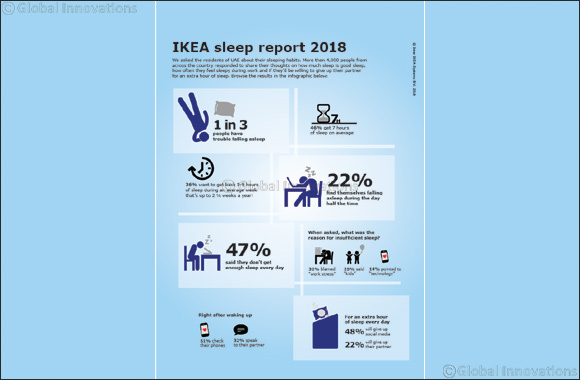 United Arab Emirates, 18 February 2018: Most people in the UAE get an average of seven healthy hours of sleep a night, yet we still yearn for more according to a poll* conducted by much-loved Swedish home furnishing retailer, IKEA. Work stress, kids and technology came out on top when people were asked why they were missing out on sleep. But the most revealing statistic showed that 48% would give up social media for an extra hour in bed each day, with nearly one in four saying they would give up their own partner! Technology features heavily in our sleep and bedroom habits; half of the respondents admitted that they look at their phone before they speak to their partner in the morning, and on average 60% will look at an electronic device within five minutes of waking up. Despite getting the required amount of sleep each night, nearly half wake up in the night regularly. The poll also revealed that one in three believe they miss out on many hours of sleep and if they could, they would take back an equivalent of two and half weeks’ worth of sleep a year. However, bedtime rituals vary greatly from person-to-person; from reading (17%) to meditation (18%) and music (14%) to showering (6%), however nearly a third don’t have any ritual to help them nod off. “At IKEA we believe that to enhance your sleep and relaxation, you don’t need to give up the things you love most in life, but it is important to not only focus on the mattress and bed that you choose, but also the surroundings of where you sleep.”, Vinod continued. As part of its current campaign ‘make room for sleep and relaxation’, IKEA is launching the ‘Nap Truck’ with a beautifully designed bedroom inside, for sleepy passers-by to take a 20-minute power nap. The IKEA Nap Truck will be touring the city of Dubai, Abu Dhabi and Al Ain from 22 February to 6 March.